President Moon Jae-in’s chaebol reform drive became even more clear on Sunday as he named a longtime activist for shareholders’ rights and transparent corporate governance as the chief of the staff for policy, a position he revived for swift changes on overall economic policies. Jang Ha-sung, a business professor at Korea University, is “the right person,” to shift an outdated socio-economic paradigm that long focused on ways to support conglomerates for the nation’s growth to ones that put the workers and small businesses first, Moon said while announcing his name on Sunday. An income-led growth strategy is one of Moon‘s campaign pledges of which he believes that increasing household income by boosting employment and expanding welfare benefits would expand domestic consumption, and also corporate investment. The announcement came less than a week after he named Kim Sang-jo, another chaebol reform activist, as the head of the nation’s antitrust watchdog. Kim and Jang are both known for their alliances with civic groups on raising the public awareness on abnormal cross-shareholding structure and unfair inter-affiliates trading by South Korean conglomerates. The president also named Kim Dong-yeon, president of Ajou University, as the new finance minister, and also as a vice prime minister. Stressing the need to rejuvenate the nation’s slowing economy, Moon said Kim was tapped for his ability to handle crisis and push for changes. “At this critical time, he is the right person to revive the Korean economy in crisis as he has proved to be a competent economic official with an insight into macro economy and an ability to coordinate policies while working in many important posts at the Ministry of Planning and Budget and the Ministry of Strategy and Finance,“ Moon said. Kim is said to have a deep understanding on the new president’s campaign policies on job creation and welfare as he drafted similar policies during the then Roh Moo-hyun administration, Moon’s former boss and political mentor. Moon also appointed Kim Kwang-doo, former President Park Geun-hye’s advisor to economic policies as vice chair of the National Economic Advisory council, a presidential panel on national economy. 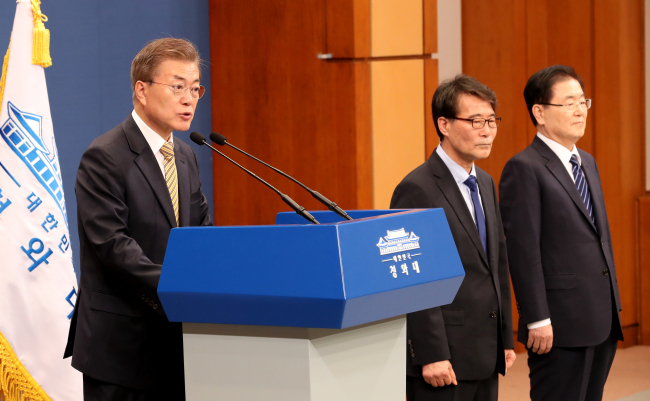 Appointing Kim, a conservative scholar as the vice chairman of the panel, suggests that Moon is willing to embrace voices from the right when seeking a consensus for envisioned economic reform, according to observers.